Having spent all of my life living in Kansas, nearly 54 years, I have considerable experience asking Kansas farmers for permission to bowhunt their land. Many nonresident bowhunters think only an outfitter, hunting club, or lease are their options for hunting midwest states. Not true. The do-it-yourself opportunities are there, but blindly traveling about asking for permission is a poor way to start. time clock, and the time of day or night means little to them. Farmers do what they have to do, when they can do it, and that depends on the weather. Don't knock on a farmers door at 6am on a rainy day and expect him to be awake. Farmers, like you and me, enjoy sleeping late on rainy mornings. After all, there's no rush since they can't get into the fields, and cattle are normally fed later in the morning and sometimes only in the evenings. So when's the best time to introduce yourself and ask about hunting? Lunch. Hands down, the very best time of day - bare none! Why lunch? Many farms are family operations, with the elder family member living at the original farm and grown sons traveling from their homes to work the farm each day. That means lunch is when the entire family is gathered. It's also a time when farmers are probably in their best mood of the day. Certainly much better than early morning when they have chores that need to be done, or late evening when they're coming in from the fields and bone tired. Trust me, lunch is the best time. Lunch may seem like you're being an inconvenience, barging in on their family time. But remember, whenever you stop a farmer to talk with him, regardless of the time of day, you're an inconvenience and that's an unavoidable fact. At least you can pick the time when he might be in his best mood. How do I ask for permission? What do I say? I'm glad you ask! Kansas farmers, like any midwestern farmer, are proud, normally very humble, plain-speaking people. If you show up at their door looking like a rock star with rap music rolling out of your $50,000 SUV, you may as well stay home. In fact if you, in any manner, try to come off as some kind of â€œbig deal" then you're doomed. Farmers are seldom impressed with who you are, or who you think you are. To them, you're somebody at the door. So how do I act? Be yourself. It's really simple. Stick your hand out and introduce yourself. "Mr. Farmer, my name's Joe Hunter and I live in My town, PA. This is my friend, Mike Smith and we're looking for a farm to bowhunt deer this week and then we're heading back home." Then lean back and say nothing. "I see. Well Joe, I'd like to help you but my grandson bowhunts my farm and I have to say no." Right now you probably feel like you've lost. Not true. Stay pleasant and then ask this: "I appreciate your time Mr. Farmer and I understand your situation with your grandson, and I'd do the same thing. Would you happen to know of any farmers that might let two responsible bowhunters hunt their place?" Again, lean back and say nothing. Guys/Gals, I promise you that 75% of the time that farmer is going to be impressed and he will mention another farmer for you to call on. For heaven sakes, when you do call on the other farmer be sure and mention the farmer's name you just left. His name is your key to hunting. That's really important. No, it's more than just important - it's everything! Now you're no longer a out-of-state stranger, but somebody who knows someone else. Get it? 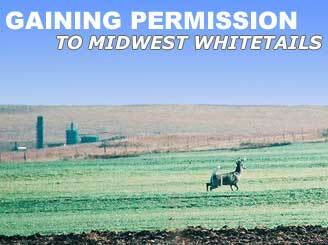 A lot of hunters like to drive around until they see a farm that looks promising and then ask for permission. That might work for local hunters, but for nonresidents That's a good way to burn a lot of gas and waste a bunch of time. Time you can't afford to waste. After all, you're not in your home state and familiar with the countryside. Farmers, especially in extremely small towns, gather in the early mornings at the local cafe. Often these will be farmers who are retired and moved to town. That doesn't mean they donut own farms anymore. Far from it! Sit down and order a cup of coffee. There's going to be people in that cafe who own farms or know farmers who will let you hunt. Ask basically the same kind of questions that I mentioned earlier. Tell them why you're there and what you need. Donut be bashful. My father always said I was born with the gift of gab. That's true; I have little problem talking with or meeting people for the first time. That's not the case with everyone, and I realize that for many hunters, starting this kind of conversation will be difficult. But realize that you're going to be communicating with individuals that have spent much of their lives in isolation. Farming is not a "people" profession; it is a lonely lifestyle. Be direct, pleasant, and leave profanity out completely - even if they use it. Churches are a good place to ask. In rural Kansas, you're going to have a difficult time finding a preacher who doesn't hunt. Preachers have the necessary knowledge due to their congregation about the local deer population. Make no mistake about that! The Sheriff's office is also excellent. Some counties have a lot of deer related car accidents and law enforcement will be glad to point you in the right direction. However, donut expect local police to be open 24hrs a day, and sometimes the sheriff also owns the local hardware store. Ask around. Finally, donut offer farmer's money. I just think That's a poor practice. Midwest farmers own equipment that cost more than you and I will make in a lifetime. Offering $30 or $40 won't impress them. What will impress them? An apple pie, a frozen turkey, or maybe a portion of your deer just before you return home, and then a thank you card once you're home. Leaving their land like you found it will make the biggest impression of all. Even though you are working on a short time frame, following my suggestions will most likely result in you being able to hunt a few days the first year, and have your foot completely in the door for the following year. Good luck. 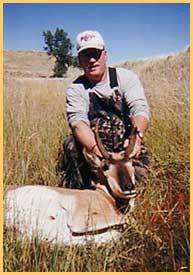 Dal Lowrey is a frequent visitor of Bowsite.com and is a Kansas resident.